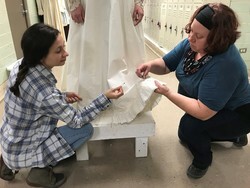 SFA senior Sarah Loveday of Leander and graduate student Jessica Tinker of Nacogdoches apply lace to the wedding dress for the upcoming presentation of Rodgers and Hammerstein's "Oklahoma!" The musical, presented by the School of Theatre, School of Music and SFA Dance Program, runs Nov. 6 through 10 in W.M. Turner Auditorium on the SFA campus. NACOGDOCHES, Texas - Collaboration among theatre, music and dance programs at Stephen F. Austin State University will bring the beloved musical "Oklahoma!" to life Nov. 6 though 10 in SFA's W.M. Turner Auditorium. The innovative musical, based on Lynn Riggs' 1931 play, "Green Grow the Lilacs," is the first musical written by the team of Richard Rodgers and Oscar Hammerstein II. The original Broadway production opened in 1943, and the musical earned Rodgers and Hammerstein the Pulitzer Prize in 1944. Celebrating its 75th anniversary this year, it was a logical choice for theatre professor Angela Bacarisse to direct as the biennial musical for the School of Theatre's Mainstage Series. "I was looking for a classical musical with equally strong parts for women as for men," said Bacarisse, who also recently directed the musicals "Spamalot" and "Bloody Bloody Andrew Jackson," which were somewhat lacking in female roles. "I have always thought that 'Oklahoma!' would be a good family friendly choice for our local audiences. Now that it is the 75th anniversary, this was a great year to do it." With all the recent attention surrounding "Hamilton: An American Musical" by Lin-Manuel Miranda, entertainment reviews and articles have compared the two musicals, Bacarisse said. "There have been articles written about how 'Oklahoma!' was the 'Hamilton' of 1943," she said. "'Oklahoma!' was the breakthrough musical of its time, and it was just as popular then as 'Hamilton' is now." With the 75th anniversary observance, recent publicity has highlighted what "Oklahoma!" meant to Americans in 1943, Bacarisse said. "Our young men and women were fighting overseas, not unlike now, and this play is about what makes America worth fighting for," she said. The musical is about two headstrong romantics' bumpy road to true love and the high-spirited rivalry between farmers and cowboys at the turn of the 20th century. Set in Plains farm country outside the town of Claremore, Oklahoma Territory, in 1906, it tells the story of farm girl Laurey Williams and her courtship by two rival suitors, cowboy Curly McLain and farmhand Jud Fry. It's a big production with a large cast, which makes directing it a big challenge, even for a seasoned director like Bacarisse, who is not only directing, but also designing the costumes, making this show Bacarisse's first one in which she's tackled both jobs. "It is big! The cast is huge, the set is huge, there is music and orchestra and dancers and flying/rolling scenery," she said. "There is a lot to keep organized." With only three weeks set aside to rehearse as a full cast, those involved in music-dance scenes started those separate rehearsals a few weeks early. "It is a very tight schedule," Bacarisse said. "I still have a lot of musical numbers to stage as well as doing on-scene work with the actors." Working through the intricacies of the musical's famous dream ballet scene takes even more rehearsal time to guarantee the vision of original choreographer Agnes de Mille. "I am really excited that we will be doing the entire dream ballet," Bacarisse said. "We are collaborating with the dance program from the Department of Kinesiology and Health Sciences. They have cast students who are studying dance. And we are all working with videos of Agnes de Mille describing her process and style so that we can better serve the story." Working with Dr. Tod Fish, associate director of choral activities at SFA, Nita Hudson, voice instructor, and collaborative pianist Dr. Thomas Nixon is adding to the rewards of directing this particular show, Bacarisse said. "They are doing a great job with the music," she said. "We recently had a sing-through with the cast, accompanied by only a piano, and it was great. I am so excited to work with them and will honestly probably start crying when we add the orchestra. "To do a show this big, it takes a village," she added. "We have faculty from theatre, music and dance as well as students who study in all of those areas involved. It is great that we get to move out of our 'silos' and collaborate on such an exciting production." Between the music, the story, the dancing and the fight scenes that define "Oklahoma!," Bacarisse guarantees that the show will have something for every audience member. "They are going to love it," she said. "Really!" "Oklahoma!" will be presented at 7:30 p.m. Tuesday through Saturday, Nov. 6 through 10, in W.M. Turner Auditorium in the Griffith Fine Arts Building, 2222 Alumni Drive, on the SFA campus. A matinee performance is at 10 a.m. Thursday, Nov. 8.